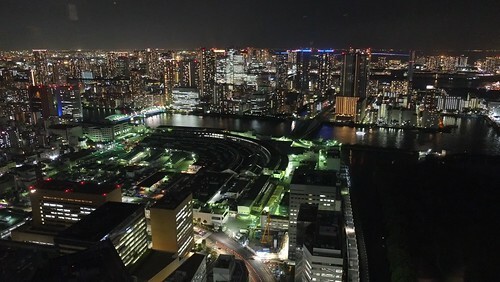 As I’ve noted earlier, Japan has some of the biggest companies in the world that are currently operating on a shortened workweek: Zozo adopted what it calls the “Rokujiro” 30-hour workweek in 2012. This article is more about companies adopting four 10-hour days, but still, it’s another straw in the wind. I’m in Seoul for the next several days, doing some publicity stuff for REST (my dad tells me that the translation is really top-notch), and also doing some interviews and fieldwork for my next book on four-day weeks. One of the things I’ve noticed in discussions of the four-day week is that most of the discussion centers around companies in Europe, the UK, Australia, and New Zealand (whoever Perpetual Guardian hired to do their PR, they really delivered value for money!). Likewise, the policy discussions mainly cite European trade unions and talking heads. One of the things I’ve found in my research, though, is that some of the biggest companies shortening their workdays and workweeks are in Japan and Korea. In Japan, I’ve found big tech companies doing 30-hour weeks, little ryokans (traditional inns) operating on a 4-day week schedule, and a big manufacturing company that switches to 4-day weeks during the summer. Coming over here to see how they do it feels important, for a couple reasons. First, I really think I’m tracking a global movement that is in its infancy, doesn’t really have a strong collective sense of itself, but in the next few years could become a really serious thing. And because of the size and number of companies, you can’t study this without studying Japan and Korea. The world’s biggest company that does 30-hour weeks is in Japan, and some of the most successful startups working shorter hours are in Korea. Talking about European companies is a good start, but it’s not the end. When nations that have powerful unions, strong social welfare, and a words for “cozy evenings by the fire wearing hand-knit socks” opt for working less, it’s both totally unsurprising, and remote. It’s hard for American companies to imagine following the Nordic model in… just about anything. However, when you talk about it being done by companies that are in countries whose languages have words for “working yourself to death,” those same audiences are more likely to sit up and take notice. Finally, because of geographical and cultural proximity, China is more likely to learn from the Korean and Japanese companies than from companies in the West. There’s already some discussion in China of aiming for a 4-day week by 2030; and if they do, that’ll be a titanic move in the global economy, not to mention a huge change in the lives of a billion-plus people. So that’s why I’m here. To get this part of the story. Of course, I’m also here for the street food! My copies of the Japanese edition of REST arrived today. 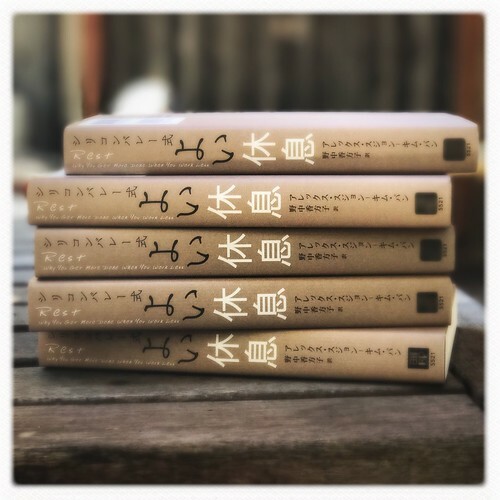 It’s always really cool to see the foreign editions, and to imagine the book being read by people I’ll never meet, in places I’ll never visit. It’s not a kind of immortality, nor is it really influence; it’s more like the satisfaction of seeing a child do well in the world, and exercising strengths that you might have helped them develop, but which they wield. 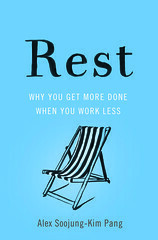 And of course I hope the book does well– more than many places, Japan needs to appreciate the value of rest, and to have corporate policies that encourage deliberate rest! The Japanese edition of REST will be out pretty soon (next Friday, I think), and the publisher sent me the cover and bookband. 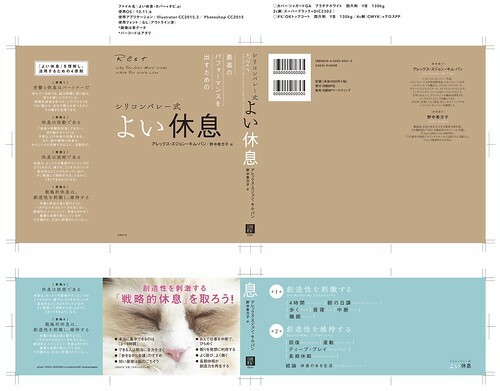 I don’t know why bookbands are such a thing in Japan, nor why there’s a cat on mine, but I like it. The Japanese edition of REST will be out in a few weeks, and I’ve started thinking about pieces that I could pitch to magazines and newspapers.